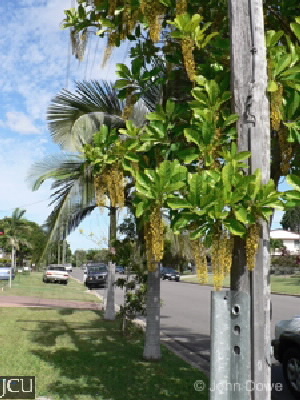 This attractive semi-deciduous tree, which is a native of Brazil and grows to about 20 m, is often planted as a street tree as well as in some gardens. The simple obovate leaves are often in whorls. Inflorescence is pendulous, flowers showy, golden yellow in colour followed by a dry fruit to 2 cm long with a single black seed, which has a short viability.